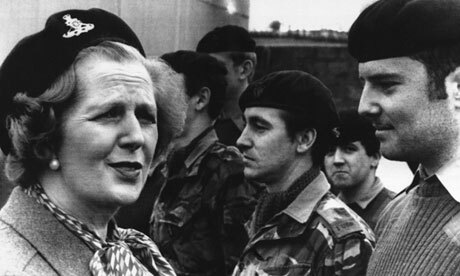 Margaret Thatcher's passing yesterday brings to mind a very stormy period in Anglo-Irish relations, the period of The Hunger Strikes [CAIN Web Service], which Dame Thatcher oversaw. The protest began with Bobby Sands' decision on March 1, 1981, to refuse food, and ended seven months later, on Oct. 3, when the six remaining prisoners on strike decided to end their protest. Meanwhile, 10, including Sands, died, leaving much of the world to ask, "Why?" In his 2005 memoir, "Green Suede Shoes: An Irish-American Odyssey," Black 47 front man Larry Kirwan wrote about the impact that the strikes had on Irish Americans, who gathered in Manhattan in a kind of vigil and protest as they watched these men, one-by-one, surrender their lives for the cause of Irish unification. "Margaret Thatcher did not have the sense or the good grace to attempt a meaningful compromise with Sands and his comrades. No matter what one thought of the conflict in the North of Ireland, who could have denied that those prisoners had a political point of view and were pursuing it for political ends? That's what the hunger strike was all about; that's what the ultimate points of principle hinged on. And that's why the protestors lined Third Avenue every minute of the day for months on end, until 10 young men starved to death. And when it was over, Irish-America was not the same. A new generation had been politicized and would hand down a new folk memory to their children and the generations following." Tell us your reflections on the passing of Margaret Thatcher, a key player in the evolution of the geo-political landscape we see in the 32 counties today. Yesterday, I woke to the news that the Devil had chosen his bride. My first thought was for the tortured souls who could now dance light and free knowing that she had finally made the journey to the depths of Hell. Throughout the day, I would engage in conversations, vehement discussions and deflect taunts and slurs. At the end of the day, I poured a large dram of whiskey and sent the angel's share to one and all of her victims. My Gran, I would like to think, is sharing a Dram or two with Michael Devine and the rest.. I always am amazed by the fascination with British government officials that a lot of people here in America have...indeed, in all matters British... I mean, we won our fight for freedom...didn't we? Yes, but Bit, with respect, I don't agree that Maggie Thatcher's passing is a cause for celebration. Perhaps I'm too philosophical, but she didn't seem an introspective soul, and I suspect she never considered her callous response to the hunger strikers as anything but doing her job. I'm not excusing this, I'm just uncomfortable judging. Let the facts of history speak for themselves, in my view. RIP. Disagree with her policies if you wish, but I find it absolutely appalling to read all these vitriolic comments all over the internet. From what I can gather, the vast majority of people here in Ireland still hate her (for varying reasons), and most are not shy about spewing vile venom about it. Totally classless, in my opinion. There are plenty of modern-day politicians with whom I disagree and may not even like personally, but to speak so hatefully (to put it mildly) of someone upon their death is just really, really sad. The hatred for the late Margaret Thatcher, former British prime minister, among a broad segment of the British public /i>http://www.guardian.co.uk/politics/2013/apr/09/opinion-sharply-divi...> has manifested itself in visible and undeniable ways in the week after her death, but these are not highlighted on American television. The status quo corporate media are afraid of admitting that policy-makers who favor the rich and punish the middle and working classes are deeply hated by the latter /font>http://www.juancole.com/2013/04/margaret-thatchers-policies.html> . Dead leaders have to be represented on television as being revered by the entirety of the public (an imaginary public for which the corporate anchors can serve as ventriloquists). That many Americans despise Ronald Reagan is likewise an unmentionable on the airwaves. Demonstrators gathered Saturday at Trafalgar Square /font>http://youtu.be/0AEtLzMGZ4c> to denounce Thatcher’s Neoliberal policies, which enriched the wealthy and harmed the middle classes, holding what they called a “death party.” Middle and working class Britons well remember how they defeated her hated poll tax /font>http://libcom.org/history/poll-tax-rebellion-danny-burns> and hastened her from office. Then, Britons have been commemorating Thatcher’s death by downloading “Ding, Dong, the Witch is Dead,” /font>http://youtu.be/6VJjk5P5zkg> in high volumes, pushing it to the top of the download charts. The British Broadcast Company was put in a difficult position, because it has a show that plays the top downloaded songs, and it didn’t want to be seen as endorsing this use of the tune. The BBC dealt with the problem by only playing an excerpt of the song, which satisfied no one. British soccer fans for some time have been singing at the matches, /font>http://youtu.be/W_uHxX8DQXY> “When Maggie Thatcher Dies, we’re going to have a party!” because of what they see as her dishonesty in the Hillsborough affair /font>http://bleacherreport.com/articles/1596713-margaret-thatchers-footb...> .